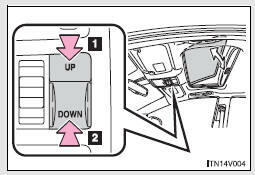 Use the overhead switches to open, close, and tilt the moon roof up and down. The moon roof stops slightly before the fully open position to reduce wind noise. Move the switch backward again to fully open. 2. Close (push and hold) The moon roof stops once. Push and hold the switch again to fully close. - Operating the moon roof after turning the engine off ►Vehicles with smart key system The moon roof can be operated for approximately 45 seconds even after the “ENGINE START STOP” switch is turned to ACCESSORY mode or turned off. It cannot, however, be operated once either front door is opened. ►Vehicles without smart key system The moon roof can be operated for approximately 45 seconds even after the engine switch is turned to the “ACC” or “LOCK” position. It cannot, however, be operated once either front door is opened. When the moon roof is opened automatically, it will stop slightly before the fully open position. Driving with the moon roof in this position can help reduce wind noise. ► Vehicles with smart key system The buzzer sounds and message is shown on the multi-information display (TFT type only) when the “ENGINE START STOP” switch is turned off and the driver’s door is opened with the moon roof open. 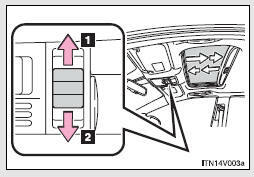 ►Vehicles without smart key system The buzzer sounds and message is shown on the multi-information display (TFT type only) when the engine switch is turned to the “LOCK” position and the driver’s door is opened with the moon roof open. Open the moon roof halfway. When the moon roof reaches the full close position, maintain the open/close switch in the close position for more than 2 seconds. It will adjust slightly and then stop. make sure opening, closing, tilting up and down functions work properly. • Do not allow any passengers to put their hands or heads outside the vehicle while it is moving. • Do not sit on top of the moon roof. • Check to make sure that all passengers do not have any part of their bodies in a position where they could be caught when the moon roof is being operated. • Do not allow children to operate the moon roof. Closing the moon roof on someone can cause death or serious injury.